The search is on to find a team of volunteers to help Norwich Cathedral have some serious fun this summer. 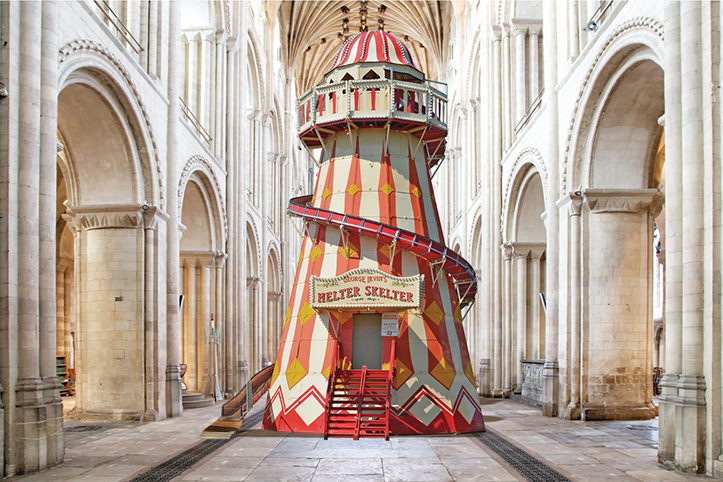 The fun comes in the shape of a 50ft-high helter-skelter in the Cathedral’s Nave which will form the centrepiece to the Seeing it Differently project from Thursday 8 August to Sunday 18 August. “Seeing it Differently is an 11-day missional event at Norwich Cathedral. We want to help people to literally see the Cathedral differently but also to open up the conversation as to how God can help us see life differently. “The star attraction will be the traditional pepperpot-shaped helter-skelter at the west end of the Nave. Climbing to the top of the helter-skelter will give visitors a unique view of the Cathedral. “To make each of these activities a genuine opportunity for God conversations we will need the support of a large team of trained volunteers. Two volunteers will be stationed at each of the Seeing it Differently zones, both helping people to engage with the activity as well as being open to those naturally occurring God conversations that may emerge. Seeing it Differently volunteers will be required to cover three or more shifts during the project. From Monday to Saturday, shifts will be 10am until 1.30pm or 1.30pm until 5pm. Sunday shifts will be 12pm until 3pm. Volunteers will also need to attend a training day in advance of the event. For general enquiries about Seeing it Differently, call the Revd Canon Andy Bryant on 01603 218331 or email canon.missionandpastoral@cathedral.org.uk. More details about Seeing it Differently can be found on Norwich Cathedral’s website – www.cathedral.org.uk.